It was a painful sight for fans of UFC Hall of Famer BJ Penn, but featherweight phenom Yair Rodriguez did what he had to do to cement a changing of the guard in the sport on Sunday at Talking Stick Resort Arena in Phoenix, stopping the comebacking 38-year-old in the second round of their UFC Fight Night main event. Rodriguez may have had respect for Penn before and after the fight, but in the five minutes and 24 seconds in which they fought, he was all business, disregarding the aura of the former two-time UFC champion, who was fighting for the first time since he retired after losing to Frankie Edgar in 2014. And while Penn was focused and in shape, the 24-year-old was too much for him. Rodriguez opened the fight with a kick to the head, but Penn took it well and rushed his opponent, pushing him into the fence. Rodriguez broke the clinch and continued to fire kicks. Penn marched forward but wasn’t able to get any shots off. With three minutes left, Rodriguez briefly staggered Penn with a kick to the head, and “El Pantera” now had Penn backpedaling and on the defensive. In the final 90 seconds, Penn began getting caught with more and more kicks, the Hawaiian superstar having little answer for the up and comer. Penn gamely came out for the second round, but Rodriguez put a quick end to matters with a right kick to the face followed by a right hand. 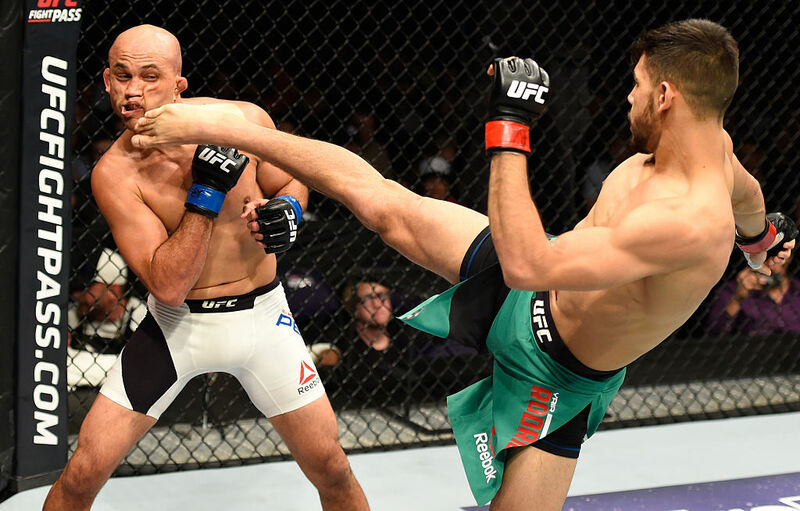 Penn tried to defend himself on the ground, but Rodriguez’ relentless follow-up attack was too much, as John McCarthy called a halt to the bout 24 seconds into the frame. With the win, the No. 10-ranked Rodriguez improves to 11-1; Hilo’s Penn falls to 16-11-2.